Reba McEntire, who is hosting the show for a record 16th time, announced the nominees in top categories Wednesday. 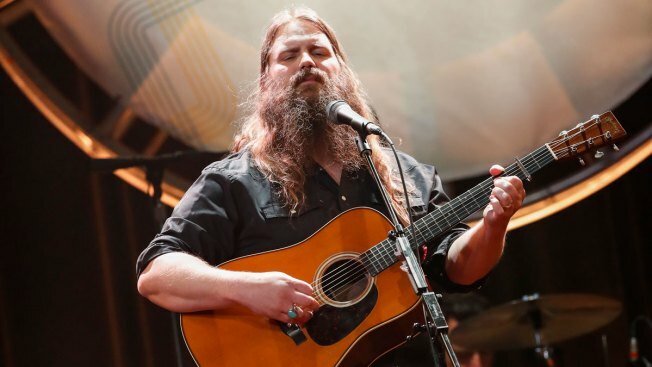 Chris Stapleton performs at the 12th Annual ACM Honors at the Ryman Auditorium in Nashville, Tenn. Stapleton, Dan + Shay lead the 54th Academy of Country Music Awards with six nominations each while Grammy album of the year winner Kacey Musgraves comes in with five nominations. Chris Stapleton and Dan + Shay lead the 54th Academy of Country Music Awards with six nominations each while Grammy album of the year winner Kacey Musgraves comes in with five nominations. Reba McEntire, who is hosting the show for a record 16th time, announced the nominees in top categories on "CBS This Morning" on Wednesday. The top category, entertainer of the year, is all male for the second year in a row, which includes Stapleton, Jason Aldean, Luke Bryan, Kenny Chesney and Keith Urban. Even McEntire noted the lack of women in the top category during the announcement, saying "I doesn't make me very happy because we've got some very talented women who are working their butts off." And Musgraves is the sole female artist in the album of the year category along with Stapleton, Dan + Shay, Eric Church and Dierks Bentley. The ACMs will be aired on CBS on April 7 from the MGM Grand Arena in Las Vegas. Stapleton is nominated twice as producer and artist for album of the year for "From A Room: Volume 2," which he won last year for "From A Room: Volume 1." He also seeks to win his second consecutive male artist of the year trophy and is nominated twice for song of the year for "Broken Halos," for which he is also nominated as a producer. Dan + Shay could make good on their first Grammy win for best country duo/group performance for "Tequila," which has earned them three nominations as a duo at the ACMs. They are also nominated for duo of the year, album of the year for their self-titled release and music event of the year for a duet with Kelly Clarkson. Dan Smyers earned four individual nominations for his work as a producer and songwriter. "I was just refreshing the ACM Awards twitter and I just kept seeing our name pop up and I was like, this has got to be some kind of joke or a mistake," Smyers told The Associated Press on Wednesday morning. " The multi-platinum swelling piano ballad "Tequila" reached the Top 10 on Billboard's Adult Top 40 chart and hit their career best of No. 21 on the all-genre Hot 100 chart. Their follow-up, "Speechless," kept the momentum going for the pair. Smyers said that getting nominated for album of the year was a special honor. "I knew this was an important album in our career, the third album," Smyers said. "We had built up our brand with our first two albums and now we had a bit of awareness. We needed to really deliver. I pushed myself to be better as a producer, better as a songwriter. We would spend hours tracking vocals." Musgraves beat out the biggest-selling albums of the year by Cardi B and Drake for album of the year at this year's Grammy Awards, but her lack of airplay meant she missed out on a single of the year nomination at the ACMs. She won four total Grammys this year, including best country album and best country song. She is nominated twice as producer and artist for album of the year for "Golden Hour," and twice for song of the year for "Space Cowboy," which only reached top 30 on Billboard's Hot Country chart. She's also nominated for female artist of the year. Bentley, Brothers Osborne, Florida Georgia Line, Bebe Rexha also had four nominations each. Rexha and Florida Georgia Line's "Meant To Be," which spent a historic 50 consecutive weeks on the top of the Hot Country Songs chart, has three nominations for single of the year, music event of the year and song of the year. Pop star Taylor Swift could earn another ACM award if her duet with Sugarland "Babe," wins the video of the year category, which also includes nominations for Midland, Dierks Bentley, Brothers Osborne, Dan + Shay and Chris Janson. Producer Ian Fitchuk has six total nominations, including one as producer for Musgraves' "Gold Hour," and five other nominations across the studio recording categories. This year, the ACMs are bringing back their artist of the decade honor, which will be announced later. Previous honorees include Marty Robbins, Loretta Lynn, Alabama, Garth Brooks and George Strait.